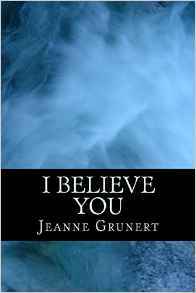 Jeanne Grunert requested a review of her self-published book I Believe You, a family crime thriller. Requests to review books are not uncommon, but hers had a nice benefit: she’d send three copies of I Believe You to the bookstore and sales would go to the Appalachian Feline Friends. But then one fears reviewing books on a benefit basis because what if you don’t like it? Not to worry this time. Unlike many self-published authors, Grunert is a master not only of writing, but of editing and graphic design. Her book is visually pleasing, well-formatted, and lacking in those extraordinary typos that make people want to take pot-shots at self-published authors. But mostly the story is told through dialogue rather than description. It moves quickly, with just enough characterization to make you care but not enough to slow the action. You sympathize with the bereaved David and his sons, get a kick out of his interaction with his sister Eva (who is keeping the house afloat via her maid service) and watch the elusive woman Turquoise slowly land like a butterfly in their midst. For all that it’s a thriller, the book turns less on unexpected whodunit than on the development of why. You know me, gentle readers: character-driven plots are my thing. So I can totally say I believe in I Believe You. And we have three copies here if you want one. I probably should have asked Jeanne the price…. A review of my book, “I Believe You”, from author Wendy Welch.